Southland Speedway was a one mile oval racetrack that opened in 1952, The track was the second super speedway ever built, the first being Darlington Raceway, It was the first super speedway to go under lights and receive sanctioning to run at night. The track was long and narrow in shape with straights about 1850 feet in length, the turns were banked to sixteen degrees and the straight were flat. Southland Speedways first major event was the running of a 200 mile AAA sanctioned Indy Car race on the 4th of July 1952, That race was won by Troy Ruttman in an Offy powered Kuzma. 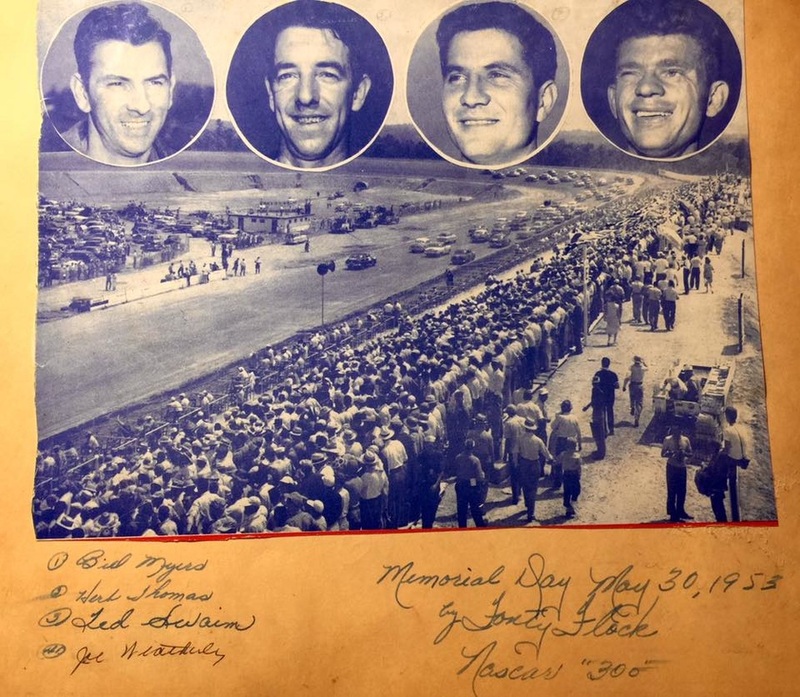 By 1953 the name of the track was changed from Southland to Raleigh Speedway, This was the year that NASCAR sanctioned events began, The first of these events were held on the 30th of May 1953. 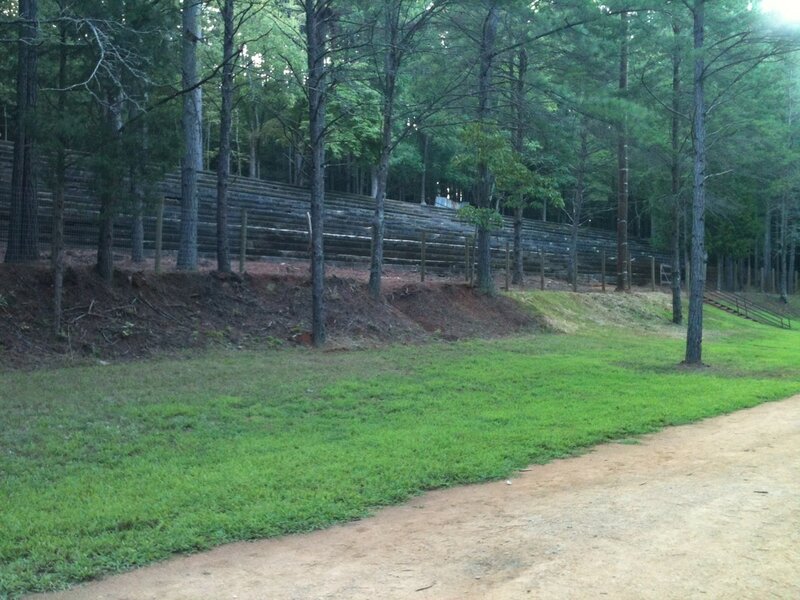 The speedway was also known by its nick name Dixie Speedway over its life. Modified and Sportsman racing meeting were held on the 1/4 mile infield track on a weekly basis, These meetings were held on a Friday, On occasions the sportsmans and modifieds did run on the one mile track. Two fatalities occoured at the speedway during a night meeting on the 19th of September 1953, Drivers Bill Blevins and Jesse Midkiff were both killed in a firey crash during the start of a combined Modified and Sportsman race. As the sixty car field took the green race officials had not noticed that Blevin's car had stalled at the exit of turn two, As the field now at full speed entered the back straight they did not see Blevin's dark maroon car sitting on the race line, One car ran into the back of Blevins car, causing a chain reaction. Blevin's was trapped in his car that was sending flames one hundred feet into the air from the full fuel load, The fire was eventualy extinguished and the driver removed from the car, It took well over an hour to remove 15 damaged cars and clear the track. The race did re-start but shortened to 170 miles, The winner of the race was Buddy Shuman. 4th of July Nascar action on the speedway. Photo: unknown. 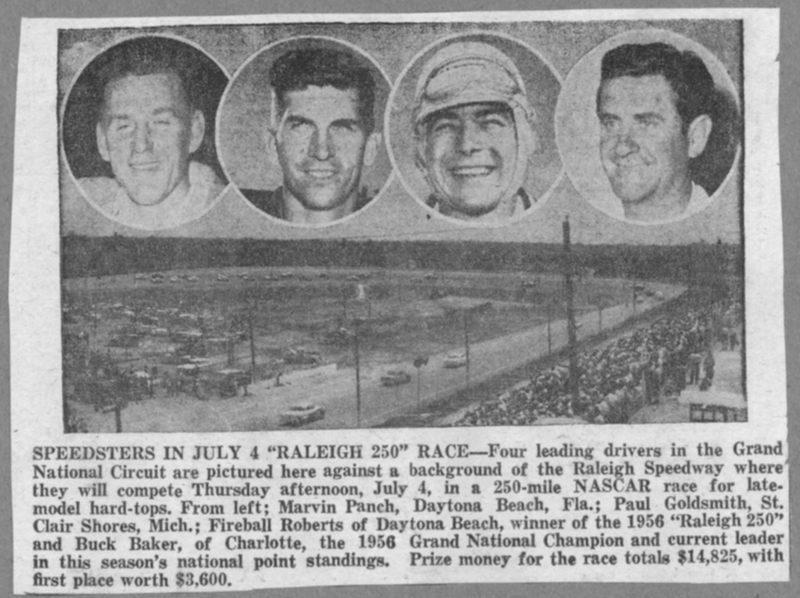 Raleigh Speedway held its last race meeting and closed on the 4th of July 1958, after the City County banned sunday racing as well as some local resident lodged several noise complaints. The entire venue was demolished in 1967 to make way for an Industrial area.